Just a few months into its third term as a non-permanent member on the UN Security Council, questions are being asked about whether South Africa can influence peace and security trends. These are valid, especially given the threat that institutions of multilaterism face in the current global climate. Closer to home, a more relevant question – especially with decisive elections just a month away – is why South Africa’s position on the Security Council matters to the country. South Africa’s two-year term started in January 2019. Saying that a council seat provides an excellent platform to show South Africa’s commitment to good governance and human rights is not just a matter of lofty principle. It is a practical necessity that should underpin Pretoria’s economic diplomacy strategy and President Cyril Ramaphosa’s daunting task of rescuing the economy from the disastrous effects of the Zuma presidency. A seat on the Security Council comes at just the right time to resuscitate South Africa’s global brand. With our remarkable history, South Africa can make a significant contribution to international affairs at a time when the world needs leadership that confirms – rather than rejects – multilateralism, accountability and strength by unity. Since 2018 the new government has set out to once again shape the country’s foreign policy around these core values. As a constitutionalist, the president knows that South Africa’s future depends on keeping these values at the centre of domestic and foreign policy. At home, Ramaphosa needs to show that government is tackling corruption and bad governance. Regionally, South Africa must be a trusted partner that cares about African priorities and the economic integration of the continent. Globally the country’s reputation for respecting the law and good governance must be rebuilt. Foreign investors stand ready to be convinced on this score. Already though there is concern about the growing divide between Ramaphosa’s ‘new dawn’ mantra and reality, and any more uncertainty will harm his investment drive. The president must achieve all this in the face of strong domestic political headwinds, and risks from the formidable hard-line faction in the ruling African National Congress. Getting it right on the world stage is critical to making South Africa more attractive for foreign direct investment. But the country will only get one shot at it, and the clock is ticking. The pressure of realpolitik will be intense but we can’t rely on investments from BRICS countries and Saudi Arabia alone. Balancing this will be one of Ramaphosa’s greatest foreign policy challenges. Beyond reputational and economic diplomacy benefits, South Africa can also shape global responses to its own foreign policy priorities. Four of these stand out. First, South Africa can continue to lead on building the partnership between the UN and the African Union (AU). Admittedly, this task is now much harder after the Security Council rejected a draft resolution on financing AU-led peace operations in December 2018. Although relations between the two bodies are strained, several other areas of the partnership could be boosted. Second, South Africa can pick up the mantle from Sweden to work with countries like the UK in advancing the Women, Peace and Security agenda as well as the emerging issue of Youth, Peace and Security. Both are gaining momentum and need global support. South Africa’s own experiences show the benefits of more inclusive actions by the council. Third, South Africa has – to the surprise of some observers – included countering terrorism and violent extremism as a foreign policy priority. As the threat evolves, the Security Council needs innovative thinking about responses that favour criminal justice and protect human rights. Key trends to watch include the rise of white nationalist terrorism, the threat from foreign terrorist fighters as ISIS’ so-called Caliphate collapses, and violent extremism in Africa, notably in the Horn and Sahel. South Africa’s experience in prosecuting complex transnational terrorism cases provides useful insights. The country can also lead on committing to a justice-first approach, even if it means collecting evidence in hostile battlefield contexts. The question of administrative measures to strip citizenship in relation to foreign terrorist fighters and their families is also an issue that South Africa could show leadership on. Apartheid is a crime against humanity – how can SA not lead global efforts on these abuses? 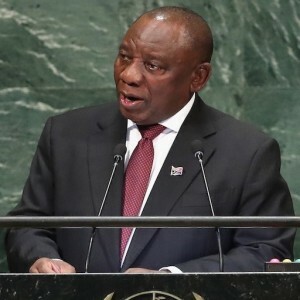 The fourth and most controversial recommendation is that South Africa could shape the Security Council’s engagement with the International Criminal Court (ICC). International justice represents values that South Africa has, since Nelson Mandela’s presidency, been recognised for: accountability, human rights and protecting ordinary people from systemic violations by those in power. Apartheid is after all a crime against humanity under international law – how can South Africa not lead global efforts on these abuses? The government’s position on the ICC project is still uncertain, but South Africa is poised to become a re-invigorated insider on this important debate. African victims of grave crimes deserve justice – of that there can be no doubt. In recent months Ramaphosa and Sisulu have indicated their commitment to international justice, and the country’s need for the tools to deliver it. This includes the ICC, warts and all. For some, expecting Ramaphosa and the ANC-led government to prioritise values-based foreign policy on the Security Council is a pipe dream, particularly with so many distracting domestic challenges. But our global and local futures are linked. South Africa’s future depends on recommitting to the values that got us to the high table in the first place. Only then will investors take the country’s leadership seriously. The stakes could not be higher. In the interests of the country, and Africa, we should worry less about raising expectations and instead get to work to make sure that we exceed them.